PET CT Scan is a form of imaging diagnosis or test that allows the doctors to check for different diseases in a human body. The scan uses special radioactive material along with glucose that is injected in the veins of the patient. The organs absorb this solution and the organs get highlighted under the PET CT scanner and the doctors can analyze how well the organs and tissues are working. The PET CT also helps the doctor measure the blood flow, oxygen use and how your body uses sugar. Let us have a look at how this process works. There are several imaging tests like X-rays, CT, MRI and PET/PET CT for different type of image capturing for diagnosis of chronic diseases. PET CT scan is a combination of positron emission tomography (PET) and computed tomography (CT) into one single machine and is an advanced nuclear imaging technique used in diagnosis of many diseases these days. Other imaging scans give details only about the structural form of the organs and tissue, whereas a full body PET CT scans provides information of both, structural and functional details about the organs and the tissues of the body at cellular and molecular level. Normally, a PET CT scans takes about 20 – 90 minutes, depending on the part of the body being scanned. The patient usually spends two to three hours at the imaging center including the 60 minutes resting time before the scan. You may be asked to fast a few hours (6 hours approx) before the scan. Following which, you may be injected with a solution which is a mixture of glucose and radioactive materials in the veins. The organs and tissues to be examined absorb this solution. The PET CT scanner is an “O” shaped machine, similar to a tunnel. You rest over a table which is attached to the machine and that slides into the scanner. PET CT scans are used in many fields of study but widely used in early detection and diagnoses of Cancer. The cancerous cells use more glucose than the normal cells. Hence they get highlighted under the PET CT scanner. The doctors then can see the highlighted damaged or cancerous cells and determine the size and grade of the tumor. 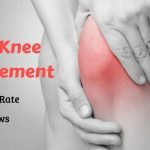 This is a non-invasive, painless procedure and the time varies depending on the part of the body that is being diagnosed. The images are captured during a single session and with a high level of accuracy. Post scan, the doctors can decide on the appropriate treatment to be advised. The doctor may advise for a more number of sessions to have a check on how you are responding to the treatment and whether the treatment is working or not. Depending on the symptoms the scan may be repeated post treatment as well. Diabetic patients need to take a little extra care while taking the scan. Diabetic patients should take medications as prescribed to ensure their blood sugar is below 200 mg/dl. The scan cannot be performed if your blood sugar is above 200 mg/dl. If you depend on insulin for blood sugar levels, you are not allowed to take insulin within 2 hours of your appointment time. You may take insulin after the scan is completed. Only Oral diabetic medications can be taken prior to the scan. PET CT is an advanced technology used in the nuclear imaging and follows a list of strict guidelines. All the patients are supposed to adhere to the same. Let us see a few Do’s and Dont’s a patients needs to know before a PET CT scan. Dress warmly from a day prior to the scan. Keeping yourself warm will reduce the production of a special type of fat from becoming active, which can hinder the scan results. Diabetic patients can eat a meal (6 hours before) before the scan. Inform the doctor/radiologist if you are pregnant or going to be pregnant. Inform the doctor/radiologist if you are allergic to any medications, foods, iodine or any other contrast materials. Cancer is one among the top killers of India. After cardiovascular diseases and stroke, if there is anything that takes away many lives in India is Cancer. Being a cell level disease, Cancer harms the body when the cells divide uncontrollably to form masses or lumps of unwanted cells called tumors. A human body is considered to be functioning properly and healthy, when the cells of the body grow and divide with necessity. When tumors grow, they interfere with the digestive, nervous and circulatory systems and release certain hormones that alter the functioning of the body. Tumors can be benign or malignant. Benign tumors are non-cancerous and are not really life threatening. They can be removed with the help of surgical procedures and usually do not return. Malignant tumors are cancerous and life threatening. They occur when a cancerous cell manages to detach from the current location to spread over other parts of the body disturbing the functioning of that part too and destroying the healthy tissues. A full body PET CT also helps locate the cancer, whether it is static or spread to the other organs. Helps determine an appropriate treatment, and can check whether the patient is responding to the treatment. Post treatment, depending upon the symptoms, usually helps to find if the cancer has returned. PET CT scan is not advisable for pregnant ladies. It is not considered safe for developing fetus. The scan cannot be taken even if the patient is breast-feeding. It is also harmful for the patients with kidney disease and who have high level of creatinine in their body. What are the other diseases that a full body PET CT scan can diagnose? There has been a huge shift in India, may it be the lifestyle or eating habits or the way people take up their physical activities. There is a development happening at tremendous levels in the country which has resulted in the change in lifestyle, eating habits, socio-economic reforms and upto an extent even culture. There is a huge shift in the burden of diseases in the country. In early 90s, people faced problems and life challenges with diseases like communicable diseases, maternal mortality and infectious diseases, malnutrition and other diseases like plague, but today there is dangerous shift in the burden of diseases. People are losing lives due to Non-communicable diseases which accounts for almost 61% of the total deaths in the country. 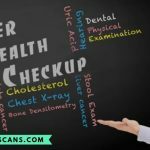 Diseases like cardiovascular diseases, ischemic heart disease, stroke, kidney and liver diseases, diabetes and cancer along with the risk factors like obesity, junk food intake, physical inactivity, hypertension and cholesterol have been among the top killers of the globe, and India is one among them who suffers. Diagnosing these diseases early and at the right time will definitely make a huge difference in the health management of people and also save millions on the treatment costs. This also helps in increasing the life expectancy rate and people can have a better quality of life. Nuclear medicine is well known today for early diagnosis of many chronic diseases other than cancer. The radioactive glucose that is injected into the veins of the human body during scan helps in information gathering of almost all the tissues of the body. It helps in diagnosing abnormalities in the organs or tissues in the body and helps in the early detection of diseases. According to the requirement of the diseases, the doctor decides, if the patient needs only a PET scan or a PET CT scan. PET/PET CT scans are widely used and applied in many fields like Oncology, Neurology, Cardiology, Infection and Inflammation imaging. Diseases that can be diagnosed with PET CT scan other than cancer can be listed out as heart problems like coronary artery disease, brain disorders like Alzheimer’s, seizures, brain tumors, memory disorders and problems associated with the central nervous system. The scan produces three dimensional images and provides information to the functional level of the organs and the tissues at cellular and molecular levels. PET scan does not rule out the usefulness of MRI or CT scans, but produces better results when combined with these scans like PET CT or PET MRI. Hosting a PET CT scanner is an expensive task. The set up cost of a PET CT scan center alone is around 100 crores including the cost of the technicians, doctors and the facilities. Currently, there are a very few well established hospitals and diagnostic centers that have the approval for PET CT Scanners. The number counted so far is 108 facility centers in the metro cities of India. There are only 21 medical cyclotrons (producer of the cancer imaging PET isotope, fludeoxyglucose (FDG) F-18) in both, the private and public sector supplying the FDG to these 108 PET facility centers. The combination of PET and CT scan produce metabolic images and this has been proven to be more effective and less time consuming. Hence this procedure in the diagnostic industry ends up being one of the most expensive scans. The cost of a full body PET CT scan procedure varies across centers. While it is entirely free in some centers, the cost of this scan in government hospital ranges from INR 2000 to INR 10,000. But when it comes to private institutions, the cost starts from INR 15,000 and may go upto INR 30,000 depending on the protocol. How can the quality of the PET CT scan centers be decided? PET CT scan is an advanced imaging technique. Setting up a PET CT scan center, needs approvals, certifications and lot of money. The centers need to be approved by the Atomic Energy Regulatory Board (AERB) to carry out the scan procedures. This is because, the radionuclides that are produced by the cyclotron used during the scan have higher energy and are short lived. There are a certain set of regulatory requirements and radiation safety precautions that all the centers approved by AERB need to follow such as the technical configuration of the machine, qualification of the technicians and also the thickness of the walls where the scanner is stationed. The center also need certifications from the ISO (International Organization for Standardization) and NABL (National Accreditation Board for Testing and Calibration Laboratories) for delivering consistent level of quality services and for maintaining technical competence for testing. Apart from the regulatory requirements of Radiation Safety Measures, protocols as per AERB, infection control and waste management as per ISO and NABL and quality services, it also takes the centers to be well equipped with high quality PET CT Scan machines which have a high resolution gamma camera. Most of the centers go for a 16 or 64 Slice (the latest in the market is 64 Slice system) machine with high power image generator. It is important to have well trained doctors who can read the images and well trained technical staff. Along with an experience of reading the PET CT results, it is basic necessity of a well qualified and trained Nuclear Medicine Radiologist to have good knowledge about the basic principles of the PET CT Scan technique, including radioprotection concepts and of the problems that may arise due to the radioactive glucose induced to the patient. Only if the above parameters are met, the scan centers can produce accurate and quality results. While all the above factors decide the quality of a PET CT scan center, finding the right one and the one nearest to you is a task. To make that easier, Bookmyscans.com is at your service. You can find one of the best quality scan centers on bookmyscans.com and book an appointment at affordable prices. 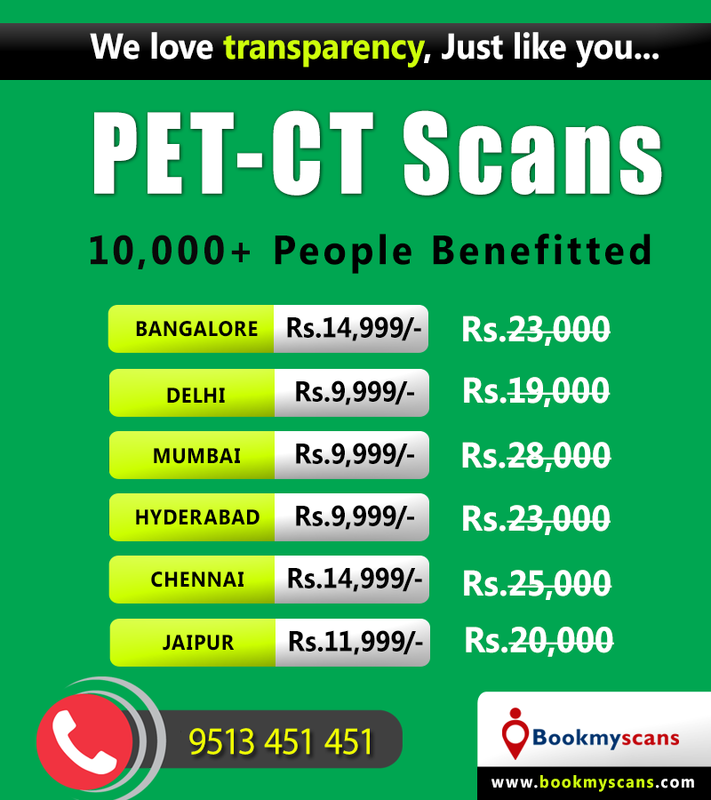 Bookmyscans is an online guide that will help you with all the information needed about PET CT scans and their center near your location. We have partners across all the major cities of India like Mumbai, Delhi, Hyderabad, Chennai, Bangalore, Raipur and Jaipur and we plan to expand in many other parts of the country. We have served more than 190,000 happy customers so far and helped in early detection and diagnosis of deadly diseases like cancer. We are happy to share that with our efforts people have been able to save more than 5.2 crores on the diagnosis, treatment and hospitalization costs they would have incurred. We partner only with centers that are approved by AERB and ISO and NABL certified. Our partners are audited periodically to make sure the quality of the services is consistent. You can also compare the price list with the other existing centers around before you book your appointments with us. We assure you the best discounts and scans at the best affordable prices. We are user friendly and easily accessible and our customer support is at your service anytime you need. We provide online reports which can be downloaded whenever needed. Bookmyscans is worth a try. We are sure you will come back again!